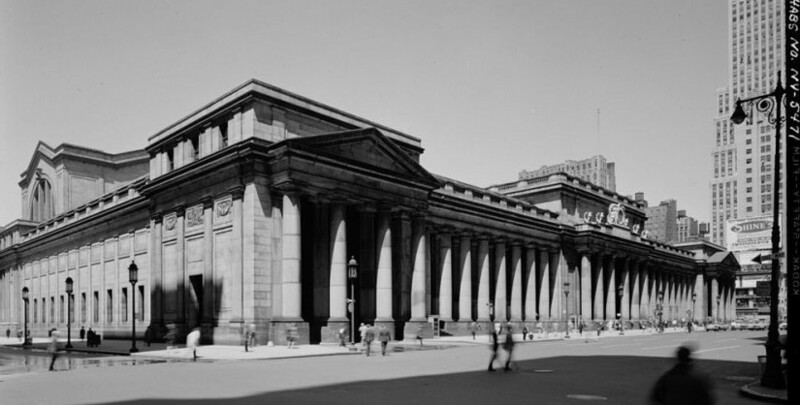 Architect and preservationist Giorgio Cavaglieri discusses the Municipal Art Society's involvement in the protests against Pennsylvania Station’s demolition. An architect who has been credited as New York’s first preservationist, Giorgio Cavaglieri pioneered the adaptive reuse of historic structures in the 1950s, designed the renovation of the Jefferson Market Courthouse into a public library, and served as president of the Municipal Art Society from 1963 to 1966. In this brief 2003 interview conducted by Annette Rosen, Cavaglieri discusses the role of the Municipal Art Society in the protests against the demolition of Pennsylvania Station. Q: I’m Annette Rosen, and I’m speaking with Giorgio Cavaglieri regarding the demolition of Penn Station. Giorgio, how did you get involved in the effort to save Penn Station? Cavaglieri: Well, I joined the Municipal Art Society in the mid-’50s. The Society, as you know, at that time, was a completely volunteer organization that promoted the world look of New York. Having heard today a list of a lot of people who were involved in the disapproval of the demolition of Pennsylvania Station, I should add at least two names that came to my mind, which should have been there somehow, who have now disappeared, for obvious calendar reasons. One was Harmon Goldstone, and one would be Morris Ketchum. Both of whom, as president of the Municipal Art Society, had been particularly involved in the promotion of the idea of preserving historic buildings. These were architects, and while the AIA [American Institute of Architects] had a historic building committee, the concept of preservation, up to the mid-’50s or late-’50s, was entirely unrelated to historical facts. The buildings that the groups were trying to preserve were only those where something of historical importance in the past of the United States had happened—where George Washington slept, where George Washington was inaugurated, where—so, federal buildings and things like that. No attention was given, in general, by these groups to the historical appearance of a building and to the importance that the historic building had to the environment that people can remember for their whole life. After all, we all think that we are born in a place, or remember where we were as children, and we think of the buildings around the environment in which we grew. Even psychologically, I think, there is a tendency for individuals to particularly be interested in the appearance of self and location. The Municipal Art Society, with this in mind, had strongly promoted the idea of preserving old buildings. As a matter of fact, I think it was perhaps Harmon Goldstone, perhaps even his predecessor as president, Bancel Lafarge. Mind you, I’m not sure of the exact timing of these, but I remember the individuals very well. They had obtained a grant, for which [Alan] Burnham—his first name now escapes me—did the book, [New York Landmarks] was a collection of 10,000 illustrations of buildings that had a historical character due to the time in which they were designed, and which had a kind of characteristic imprint in the location where they were erected. Of course, among these buildings, practically the very first imprint, and perhaps the most attractive and important one, was Pennsylvania Station. The people from the Municipal Art Society participated—me, included, being on their board, and at one time the secretary of Morris Ketchum—included among those who went to the Board of Estimate to testify against the permit to demolish Pennsylvania Station. Then, of course, when these activities were proven unsuccessful, we participated with a group that had been arranged by the New York chapter of the AIA, in which Bill Conklin and Norval White were involved, to demonstrate against the demolition. Although we knew at that time that it was too late. By that time the contractor already had his contract; the work had started. He was mounting a demonstration against this particular building in order to reinforce the propaganda that we were promoting for a new law that would prevent these demolitions in the future; that would maintain the character of New York in different areas and in different locations, with buildings of impressive design; that represented the architectural tendencies of the moment in which they were built and were erected. Cavaglieri: Any time you want. Q: It’s always a pleasure to see you. Cavaglieri: I’ll tell you whatever I can of my recollections. You know, I’ve been practicing in New York since 1946, in the same building. I went there when I came out of the Army.